I will admit, I can be a teensy bit obsessive, and lately I've been stuck on a color palette from a quilt my mom made. If you missed the inspirational quilt, you can find it in this post. The colors are purple and teal and olive and I can't get enough. 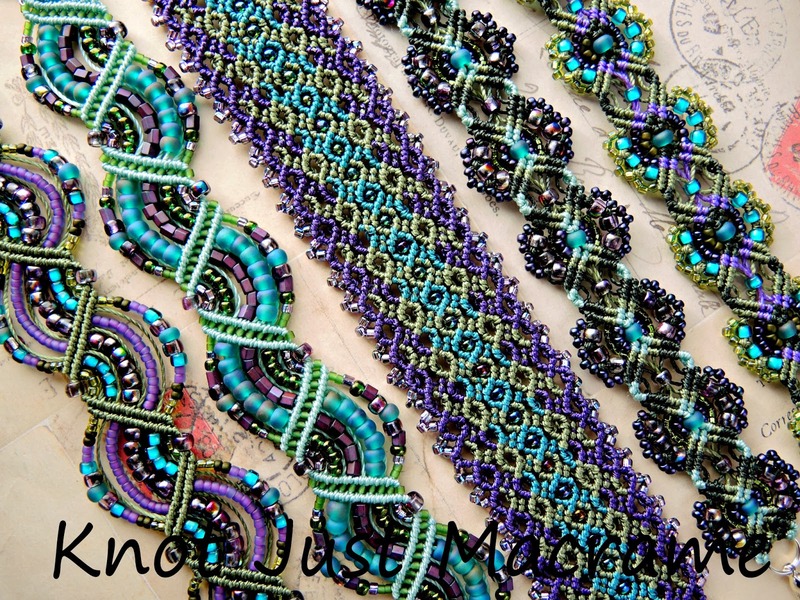 I've knotted waves of purple and teal and olive and lacy flowers of olive and purple and teal. I also admit I love to see multiple micro macrame pieces in palette side by side. To compare and contrast, you know. All that and I think I am not quite finished with these colors yet. I still see inspiration in the pile. I never thought I would like these colors together, but they are beautiful and I love them. I need to make a bracelet in these colors. Such a wonderful combination..
Those are some of my favorite colors.